Vilma Santos has made mistakes in grammar and spelling, and it was posted by Kris Aquino in Instagram. 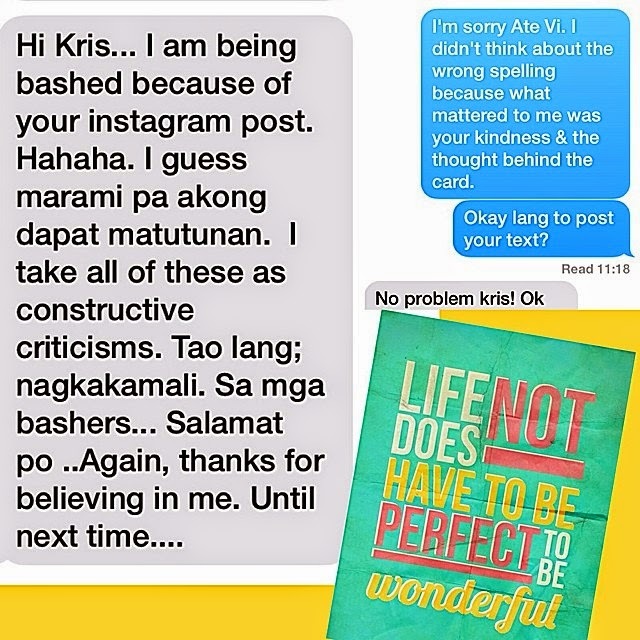 The Star for All Seasons and Governor of Batangas Vilma Santos-Recto became a subject of online bashing by "very perfect" netizens over a wrong spelling or grammatical error that she made in a card message she sent to the Queen of All Media Kris Aquino. 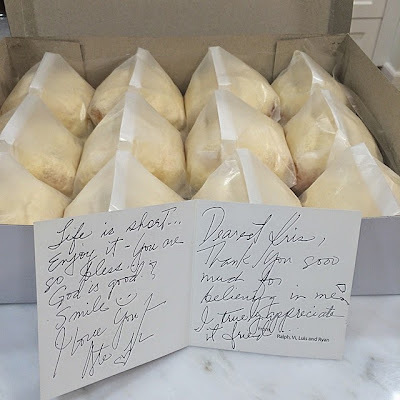 Earlier this week, Kris posted this photo in her Instagram account (@lovekrisaquino) which shows a box of ensaymada from Gov. Vilma Santos along with a personal note that says, "Dearest Kris, Thank you sooo much for believing in me. I truely appreciate it friend... Life is short... Enjoy it. You are so bless... God is good. Smile. I love you! Ate Vi"
lovekrisaquino: "Super sarap Ensaymadas from my Idol sa trabaho, serbisyo publiko & sa pag handle ng personal na buhay, sa pagiging mabuti at mapagmahal na asawa at nanay! Thank You Ate Vi!" In her message to Kris, Ate Vi wrote "bless", instead of "blessed", then misspelled "truly" as "truely". Those are just minor mistakes, but a big one for the members of the grammar police on the internet, especially in social media sites where the lady governor from Batangas was heavily bashed for the grammatical and spelling errors. The mistakes certainly won't erase the fact that Vilma Santos is Vilma Santos, and the multi-awarded actress just laughed at it, admitted her mistakes and learned from it. She even thanked the bashers in a text message, which was again posted by Kris a day after after the controversial post. 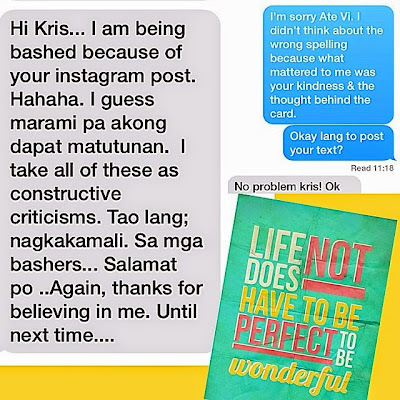 I think Kris also made a mistake of posting on Instagram Ate Vi's personal message for her. I bet she knew that it has mistakes, but still she posted it, not thinking that Ate Vi might be subject to online bashing. Maybe, she should have photographed just the foodie, and not with the card. As shown in the latest picture, the TV host-actress and Presidential Sister apologized to the Star for All Seasons and defended herself by saying that the wrong spelling didn't matter to her, and what mattered to her was Ate Vi's kindness and the thought behind the card. I remember back in 2012, the Asia's Songbird Regine Velasquez also made a grammar mistake and was also heavily criticized by people who were so confident they never committed a single grammar mistake in their entire life. Now I'm afraid I just committed some mistakes in this post. If there are, I'm already saying sorry. Nobody's perfect.